As one of Australia’s fast developing energy retailers, the design brief provided to ODC Design by Click Energy was to create a contemporary, adaptable and innovative office space which would suit our client’s work setting and future growth. 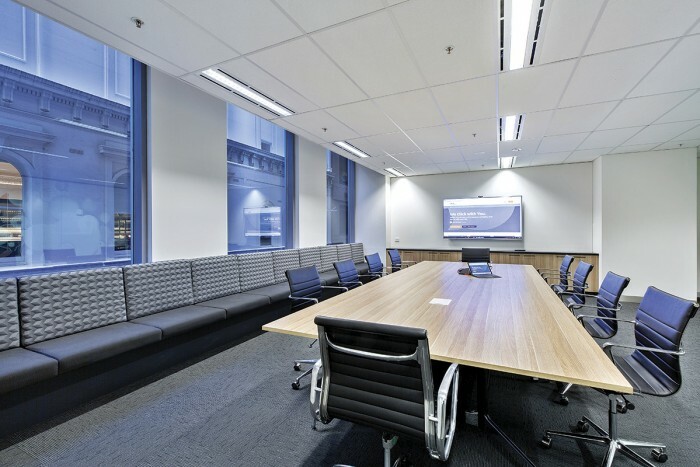 The predominantly neutral colour scheme comprises grey textured carpet, warm timber, vinyl flooring and joinery units which act to highlight the splashes of blue and orange integrated throughout the fitout including task chairs and mobile pedestals. The new layout encompasses a minimalist front of house with adjoining meeting rooms comprising of floor-to-ceiling glass panels with frosted film to provide privacy while allowing ample natural light. The unmanned reception is compensated with modern iPad touch control to efficiently manage the visitor check-in process. Click Energy’s own corporate branding designs were incorporated into the glazing design and also used to create a dynamic feature wall within the waiting area. A generous breakout space featuring elegant pendant lighting and fully functional kitchen is located strategically to create a large work hub environment where casual meetings, meals and social interaction are facilitated. Casual collaboration areas resonate throughout the open plan workspace featuring comfortable booth seating with acoustic screen panel enhancing both sound absorption and privacy. The adoption of sprawling banquet seating in the boardroom compliments the otherwise traditional boardroom arrangement while providing comfort and maximising space efficiency. Our design team created a workspace for Click Energy that is both functional and flexible which serves to encourage staff interaction and engagement while enabling future company expansion.